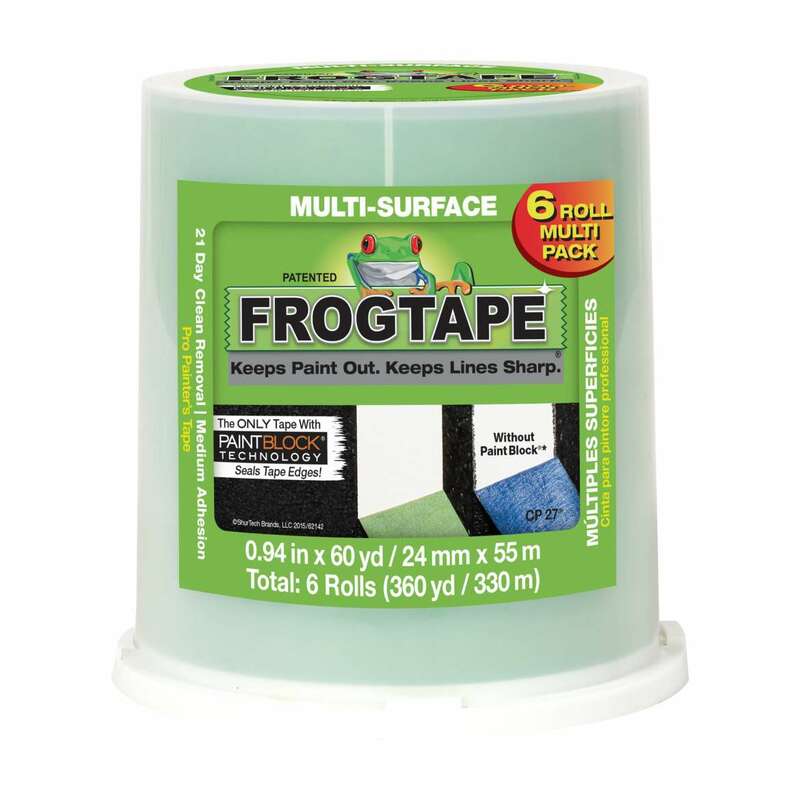 FrogTape® Multi-Surface Painting Tape - Green, 6 pk, .94 in. x 60 yd. Get crisp, clean lines on your next painting project with FrogTape® Multi-Surface Painter’s Tape. How does it work? It’s made with exclusive PaintBlock® Technology, a super-absorbent polymer that reacts with the water in latex paint and instantly gels to form a micro-barrier that seals the edges of the tape to prevent paint bleed. The result is a crisp, professional paint line. Designed to work on a variety of surfaces, this premium grade masking tape delivers a performance you can be proud of. FrogTape® Multi-Surface Painting Tape - Green, 1.41 in. x 60 yd. FrogTape® Multi-Surface Painting Tape - Green, 0.94 in. x 60 yd. FrogTape® Multi-Surface Painting Tape - Green, 1.88 in. x 60 yd. FrogTape® Multi-Surface Painting Tape - Green, 1.41 in. x 45 yd. FrogTape® Multi-Surface Painting Tape - Green, 0.94 in. x 45 yd. FrogTape® Multi-Surface Painting Tape - Green, 4 pk, 1.41 in. x 60 yd. FrogTape® Multi-Surface Painting Tape - Green, 3 pk, 1.88 in. x 60 yd. FrogTape® Multi-Surface is a premium, medium adhesion painter’s masking tape that helps you achieve crisp, clean paint lines and saves time and money by eliminating the need for touch-ups. Available in a variety of widths to accommodate any application, FrogTape® is the sharp line solution for basic masking applications or advanced wall designs like stripes or geometric patterns. FrogTape® painter’s tapes are the only tapes treated with PaintBlock® Technology, a super-absorbent polymer which reacts with latex paint and instantly gels to form a micro-barrier that seals the edges of the tape, preventing paint bleed. Learn more. Each roll comes in a reusable plastic canister designed to protect the tape’s treated edges from damage for better, more consistent results. Before you begin your paint project, follow these simple painting and masking tips to achieve the best possible results. FrogTape® painter’s tape comes in four different grades, from medium adhesion to low adhesion, textured surface and pre-cut repeating patterns. The kind of room you’re painting, the surface type and other factors can make a big difference in your results. Watch the video. Preparing a room for your next paint project is an important step in the process. Clear away room clutter, window treatments, socket and light covers, furniture, and anything else that will get in your way as you paint. Make sure you have the right tools for the job before starting, and prepare your wall’s surfaces in advance. Watch the video. Once you’ve cleaned and dried your painting surface and masked the area, make sure to eliminate any gaps along the tape edge that may occur due to light texture, bumps on the surface or uneven application. After painting, remove the tape slowly at a 45-degree angle while the paint is still wet. Watch the video. FrogTape® Delicate Surface painter's tape features low adhesion, and will remove cleanly from most surfaces for up to 60 days. Need ideas for your next paint project? Makeover your space with a little inspiration from our project gallery, where you can follow along with our step-by-step instructions, or see how other DIYers are using FrogTape® to transform their home.